PHOTO BY JACOB WALSH City of Rochester crews are preparing an Industrial Street site to serve as an encampment for homeless people. The deadline Spectrum set for residents of an encampment on its property on Mt. Hope Avenue has passed and the people are still there, but not for long. The residents have begun packing up their things and preparing to move to a new site at Industrial Street. Alex Yudelson, chief of staff to Mayor Lovely Warren, says the encampment residents will likely start moving in on September 17, and that Spectrum is OK with their continued temporary presence. 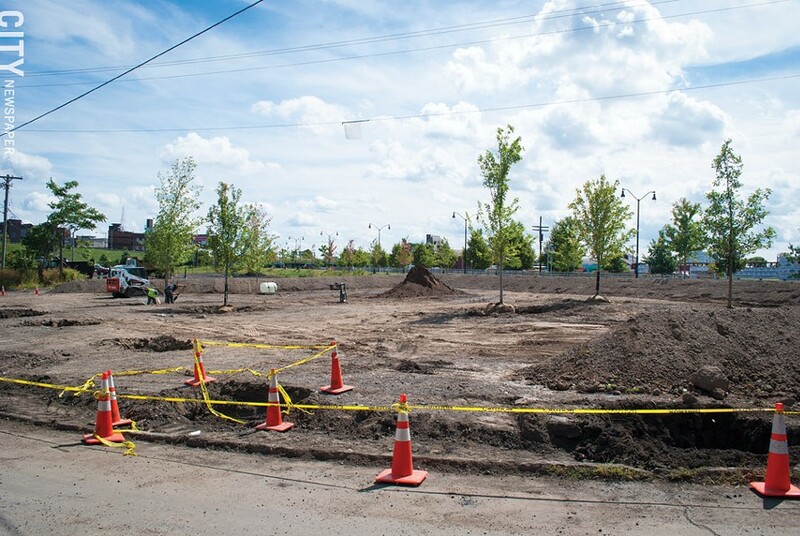 City crews have been doing some basic landscaping work at the site – previously a barren gravel lot – to make it suitable for the incoming tenants, Yudelson says. Workers have been laying sod, planting a few large trees, and putting a fence around the site, he says. Spectrum tried to force out the two-year-old encampment in April, but advocates and activists showed up and blocked the attempt. They then approached city officials about establishing a dedicated encampment site. Warren sent the proposal to City Council, and though some Council members had concerns, they approved the project – with a condition. They asked that the advocates for the encampment residents establish a formal, structured organization composed of representatives from service agencies, shelter operators, adjacent neighborhoods, and City Council. "It provides some level of accountability where if this ends up not working, we have an opportunity to assess it and address it," says City Council member Mitch Gruber. City Roots Community Land Trust has taken ownership of the property. St. Joseph's House of Hospitality and House of Mercy will handle day-to-day operations at the site. The site will have water, provided by St. Joe's, and portable toilets, provided by a donor, says City Council member Elaine Spaull, who is serving as liaison to the management organization. And Open Door Mission will be letting residents use its showers for a two-hour period each day, she says. The project is meant to make it easier for social-service providers to contact and build relationships with the residents, Gruber and Spaull say. And the ultimate goal is to help the residents move into housing, they say. The encampment is not a perfect solution, Spaull says. It's a pilot project that should be viewed as the community's best attempt at addressing a difficult problem. And if successful, Spaull says, it could be a model for other cities. If there are safety problems, they'll be addressed, she says. "Every person is a person, and it's an act of humanity," Spaull says.